Insurance Regulatory and Development Authority of India (IRDA), the apex statutory body which regulates and monitors insurance policies and marketing in India has slapped a fine of Rs 20 lakh on Apollo Munich Health Insurance. This fine has been placed as Apollo were selling insurance policies via MakeMyTrip.com, which is an unauthorized insurance seller. 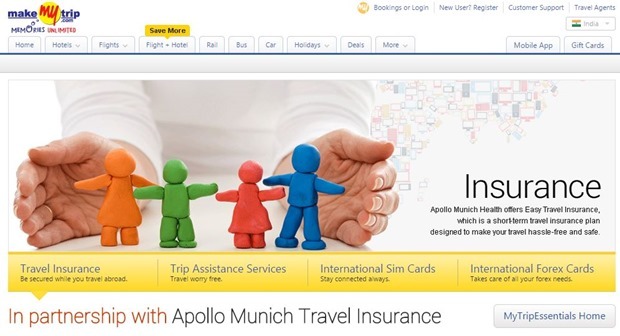 MakeMyTrip offers domestic travel insurance for their customers via Apollo Munich, which basically covers: Accident, loss of baggage, delay in receiving checked-in baggage, personal liability, personal damage, trip cancellation, delays and more. These short term travel insurance plan offered by MakeMyTrip is optional and the customer may choose it at the time of booking by paying the premium then and there. For some policies, there are future premium payments as well, which cover future domestic travels of the customers. As per IRDA Chairman TS Vijayan, Apollo & MakeMyTrip violated the regulatory norms pertaining to selling insurance policies in the years 2008-09 ; 2009-10 and 2010-11, and imposed a fine of Rs 15 lakh for that. IRDA said that the health insurer (Apollo) had accepted the risks of the insured person, even before the receipt of premium. As per various sections of Insurance Act, 1938, this is a violation of norms. Besides MakeMyTrip, Yatra.com is also offering travel insurance for their customers via Tata AIG and plans and features offered are almost like that of Apollo insurance. Cleartrip.com is also offering travel insurance, where its compulsory for International travelers. IRDA may examine their modus operandi now, and determine whether they are violating any insurance rules. Travel insurance in India is Rs 4000 crore market as per 2013-14, and is growing at a rate of 20-25% annually. Overall, online insurance industry is Rs 700 crore market right now, out of which Health and Travel insurance is worth Rs 150 crore (insurance offered by MakeMyTrip; Yatra; ClearTrip are part of this). It is expected that by 2020, online insurance will touch Rs 20 lakh crore by 2020. Abhibus doing the same for ICICI.